COLEG CAMBRIA marked a record-breaking year with a ceremony of reflection at its new £1.5m engineering complex. 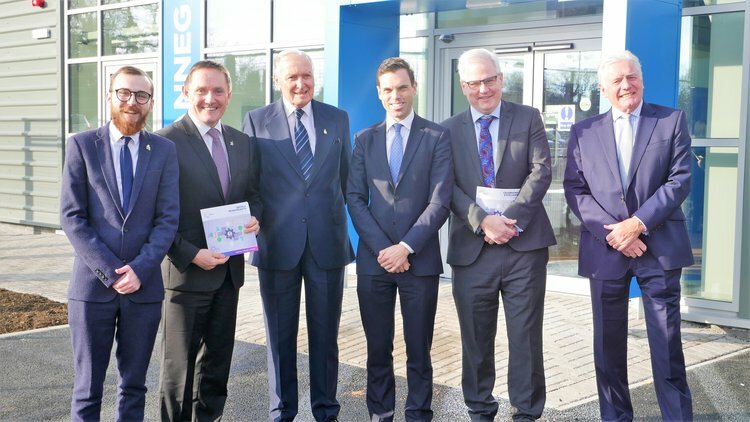 The college held its annual general meeting at the cutting-edge extension to its Centre of Engineering Excellence facility in Deeside. And what a year it has been; more than £115,000 raised for the NSPCC, Wales’ best-ever FE and work-based learning inspections from Estyn, and incredible A level results. Having celebrated its fifth anniversary last summer, the institution went on to forge leading partnerships in education, technology, sports and hospitality and won awards for adult learning, diversity, corporate health standards, sustainability and more. Cambria also broke new ground at the prestigious Worldskills competition in Birmingham, and the resulting 10-strong Welsh shortlist for the finals in Shanghai features five learners from the college – that’s more than the majority of UK counties competing in the event! Contributing hundreds of millions of pounds to the North Wales economy every year, and employing hundreds of staff, Coleg Cambria is one of the key drivers of growth in the region. As plans for a £21m redevelopment of the Yale site in Wrexham were unveiled, chief executive David Jones spoke of his pride at achievements over the last 12 months, and the college’s performance against its four-year strategy – 2020 Vision: Leading for Excellence in Education and Skills. “It has been a year of sustainable growth and outstanding achievement, as we unveiled and invested in modern buildings for our learners and apprentices and strengthened our position among the top A level providers in the UK with an overall 99% pass rate,” said Mr Jones. “Our HE provision continues to grow rapidly, heavily steered by employers and in partnership with sector leading universities, and in the community we made a difference, raising more than £115,000 for the NSPCC with the support of businesses and partners such as Sam Warburton and other special guests who joined us here in North Wales. Chair of Governors John Clutton added: “Our overriding priority continues to be delivering excellent teaching and learning, in order to stretch, challenge and inspire all learners to explore and achieve their full potential. 2019 looks to be as innovative and advancing as ever, with work at Yale now underway and plans for a £20m carbon neutral farm in Llysfasi to pioneer new technologies in digital agriculture and renewable energy, as part of the North Wales Growth Deal. The college is also looking to make strides with its innovative Active Cambria campaign, supporting staff and students to lead healthier lives for their mental health and wellbeing, and in delivering even more Welsh courses across Flintshire, Wrexham and Denbighshire, a provision well-received in 2018. “One thing is for sure, we always aim to do better and set even higher standards for ourselves,” said Mr Jones.